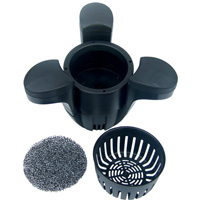 PondXpert PondMaster Pond Vacuum & Discharge Basket: Electronic Pond Vacuums: Pond Vacuums - Buy pond equipment from Pondkeeper: fishing out the best deals on the net. This special offer set pairs the NEW PondXpert PondMaster pond vacuum up with the bestselling PondXpert dirt collector basket. 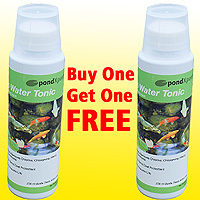 Get rid of all the muck and dirt in your pond cleanly and efficiently. This new pond vac has the highest specification of all budget vacuums available in the market today. As well as standard features such as a 2m max. operating depth and a 2m length outlet hose it also boasts additional power (1,400 watts) and a high-capacity chamber (35 litres). It also comes supplied with 4 wheels allowing easy manoeuvrability and transportation. Use the dirt collecting Vac Basket to catch solid particles - this allows you to release the filtered water back into the pond. Has transformed the pound! Our pound was deep in silt and our fountain kept getting clogged. We have had to use the vacuum a few times, (but our pound is large 5,000 litres). Now the fountain works all day long! You have to get the various heights right for it to work properly. The basket unfortunately was a waste of time. The sludge was too heavy for it and the mesh didn't filter anything. It does not do the job as advertised. 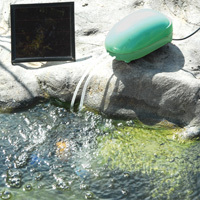 Thank you for taking the time to leave us your feedback about our bestselling pond vac. I am sorry to hear that you are not completely satisfied with this purchase. This unit relies on gravity to discharge and as you mentioned, raising the unit will help with this process.As a gesture of goodwill, I will send you out some fine filter matting to put inside the collection basket to pick up the very fine debris.If you would like to discuss this in more detail, please do not hesitate to get in touch. Easy to use and my pond is much cleaner now no dirty leaves etc at the bottom rotting away the only fault is I wish I baught one sooner. Vacuum brill,very pleased with it. Works well but doesn't clear quite what I thought it would. Bought for my husband to replace an old pond vac. A big improvement on the old one, especially with the basket addition. Not worth the outlay, very slow laborious process, vacuum only empties into filter if positioned higher than the top of filter unit. filter will only collect very large particles and bag supplied to collect for end of out feed hose keeps falling off making the process a 2 x man job. 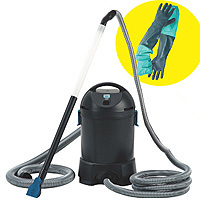 Vacuum works well but using a normal wet/dry vacuum would do the same job for a lot less expense. Had problem with foam filter, asked for replacement filter, told no bother , received complete vacuum along with invoice for full price vacuum, as to date had no reply from my email. Great pond vacuum - really works well. The only thing that could be better is the discharge basket, it could really do with a lot finer mesh.